Motivosity is specially designed to improve the work experience. With this solution, CEO or proprietor can increase the productive results for the business in a competitive atmosphere with pleasantly. It connects the people by the feedback, formal award and peer-to-peer recognition. It comes with features such as peer to peer recognition, business insights generation, formation for personality profile, dates reminder, etc. Once there was a CEO (Scott Johnson, founder & CEO of Workfront) that couldn't believe how easy it was for managers everywhere to get overly focused on results and underly focused on taking care of people . Double bonus was that he was a software tech entrepreneur who had already built a large enterprise software company and was totally capable of making the best workforce engagement solution the enterprise had ever seen... and he started waking up in the middle of the night bugged by the fact that great people everywhere are not super happy about what they do or who they do it for. That was in 2013. Today, Motivosity is driving amazing results for companies across the world. 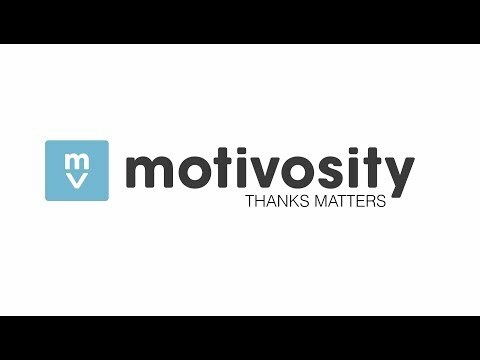 Motivosity provides an easy and social way for employees and managers to thank each other in the workplace. Link appreciation to company values to reinforce culture. Motivosity will notify the recipient each time an appreciation is given. You can also view a permanent record of each of the appreciations linked to each persons profile. As people accumulate reward money, they can spend it in the store. The store consists of about 200 digital gift cards. The store also contains other types of gifts such as 'for a cause' donation areas that the company supports, and local items like company swag. The digital rewards are 100% hands free and immediate. Motivosity doesn't charge any fees whatsoever on rewards. Data is compiled across all kinds of culture-reinforcing activities to help managers and executives drive positive results and stay focused on things that matter. Motivosity compiles monthly benchmarks and trends to present to leaders and executives in the company. This unique org chart allows people to understand who's who in the organization in a visual interactive way. Administrators can manage the org chart either by syncing with your HRIS system, or by making adjustments in Motivosity. Each node is linked to the user's profile. The org chart is accessible throughout the application. Motivosity supports your formal recognition needs through awards. Awards can be centralized or managed at the team level. Awards can prompt for nominations. A history of someone's achievements is attached to their profile. Motivosity will prompt award owners if they forget to give out regularly scheduled awards. Motivosity helps managers both remember to do their awards and helps them collect the data in such a way that the manager can be thoughtful about who receives the award. Motivosity helps you stay on top of important dates for your team. Motivosity will even remind you of upcoming big dates for your team members. In the Milestones area users can add their notes in advance. Those notes will be posted on the day of the important dates. Companies can define rules that automatically give gifts and cash on particular milestones. Every user has a profile that goes beyond the job title. Profiles consist of job information, personal interests, off-title job responsibilities, and personality profile information. All of this information is searchable and accessible from throughout the application. Responsibilities can be searched across the organization. People in common interest groups have an easy way to connect with each other. As part of the user profile, employees can take a quick personality assessment. This can be done in less than two minutes. The personality data is public and helps people receive guidance on how to interact better with the people around them. People can get a comparison chart of key differences and similarities. A personality heat map helps visualize the way areas of the company make decisions and judgements. The satisfaction survey appears to each user 4 times/year. The questions can be standardized or customized. The survey is anonymous, but linked to department and to manager. Scores can be analyzed along questions, managers, departments, and dates. There is a benchmarking service that will help you know how you compare to other similar companies.